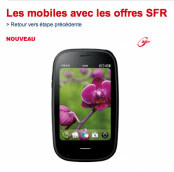 Just like last week's blunder, French telecom provider SFR have jumped the gun yet again regarding the upcoming Pre 2. As the first carrier anywhere in the world to officially launch the Pre 2 this Friday, SFR accidentally posted some interesting Pre 2 details earlier today online. Prior to pulling the page, the device's price was listed as 99 € with contract and a reasonable 449 € off-contract, full retail price. hopefully giving some kind of idea on what to expect for Pre 2 pricing in the USA.